My adventure to seek out tasty wontons continues with a visit to McKim Wonton Mein Saga in East Vancouver. This is the first time for this blog that I have visited a noodle shop claiming to be a generational wonton maker, which is what is being denoted with the word, saga. If you ever see the word, saga, in a Chinese restaurant’s name, they are trying to convey they have made something (wontons, chicken, noodles, tofu, etc) for generations and renown for it. They are not telling people they are on journey like I am when I use the same word. There are several wonton noodle houses in Greater Vancouver that claim to come from a lineage of legendary wonton makers usually with origins from Hong Kong but don’t advertise it like McKim does (you have ask the owners privately). To be honest, I was a little hesitant about coming here as the last time I ate here (pre-blog) I felt very sick from a severe case of MSG overload. However, Speedy wanted deep fried tofu with garlic and chilies and I wanted to go to some place that did not have the words, Congee or Noodle in its name. 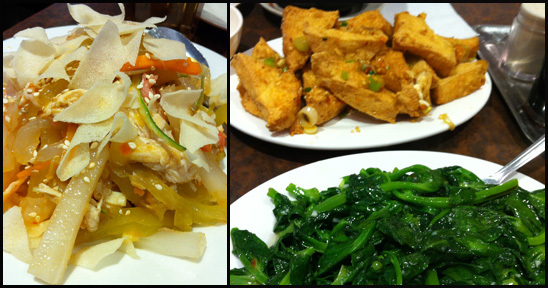 In addition to the deep fried tofu, we also order their special shredded chicken and a small plate of sautéed pea shoots. The pea shoots and shredded chicken were executed well. The deep fried tofu on the other hand where under fried and under seasoned. Since we already ordered greens, I just asked for a regular bowl of wonton noodles without vegetables. The McKim’s rendition comes with 4 smaller wontons (in comparison to Congee Noodle House). I’ve actually notice those that have some connection to a legendary wonton houses in Hong Kong, usually serve fewer wontons. 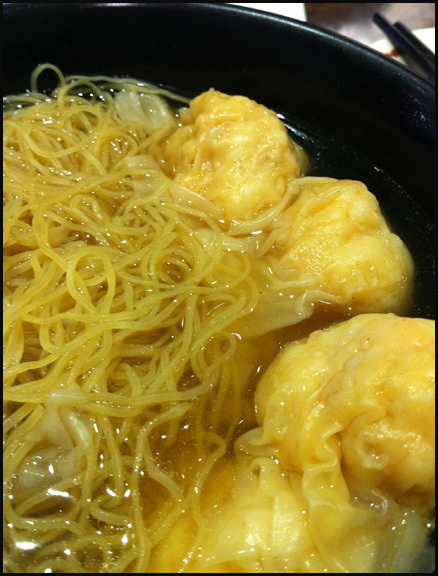 I believe the famous Mak’s in Hong Kong only doles out 4 wontons as well. As long as the shrimp bundles were tasty, the size and quantity does not really concern me. In my books it quality over quantity, but unfortunately these wontons didn’t measure up. 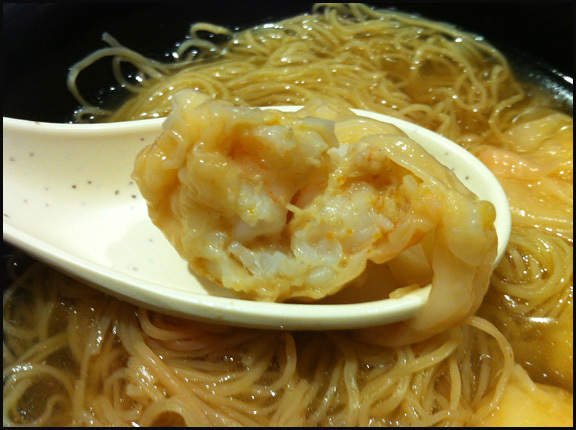 The shrimp felt a bit mushy and the filling was loosely filled and not packed tightly. Also the flavour of the filling didn’t have strong shrimp flavour. The soup had the complexity of a superior broth but I felt it was a bit bland, almost like it was watered down. The noodles were toothsome and were prepared well. Now as for the MSG issue, I can report improvement as I didn’t fell ill but was very thirsty. So at least that is a step in the right direction. Although in all fairness I cannot solely contribute my thirstiness completely on the wontons as I’m pretty the shredded chicken had some MSG in it as well. McKim, even with its claim that it has made wontons for generations, does not make make my top 3 with its soft textured wonton filling and under seasoned/watered down soup. Perhaps it’s time for me to descend to Richmond to seek out another renown wonton maker for comparison.